Like many different art forms comics are a form of art that can and will exist in many different mediums. 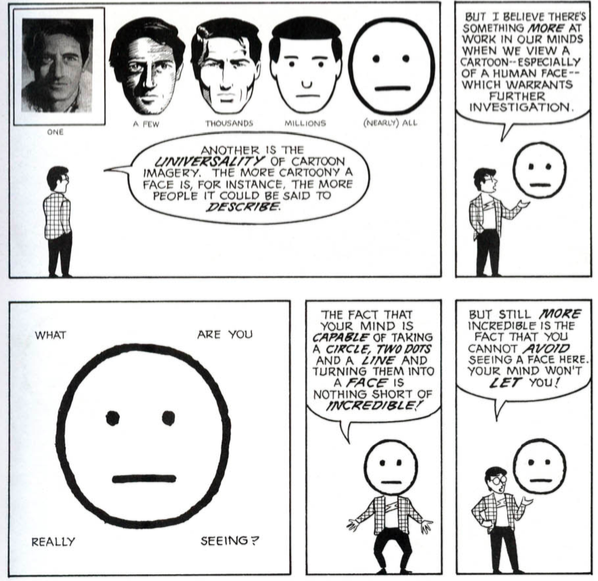 Something that I have taken away from “Understanding Comics” by Scott McCloud is that comics are supposed to be very flexible in who and what they can represent. In chapter two of Understand Comics, McCloud talks about the simplification of comic drawings in order to be able to appeal to more people, the more realistic an icon or image is drawn the less mass appeal it could potentially have. Comics are a great tool to be able to tell ones story, under the medium of comics one is able to have that story reach more people. With that established it is easy to apply this flexibility to many different mediums whether those mediums exist in a print or digital format is the fun part about comics. As McCloud states “A new generation will no doubt reject whatever this one finally decides to accept and try once more to re-invent comics”(23) meaning that the future of comics lies within the hands of those who wish to change it. That being said, the ease by which someone can access a digital comic is what draws me to that medium, people all over the world can view a comic. On top being able to view it all around the world, for those people who are differently abled comics in digital formats can be more accessible to people of all different abilities. It is always important to think about to social implications that come with deciding whether to create art or in this case comics to that are only available to people with certain abilities. For me as I am able bodied it is easy for me to access and enjoy comics in hand, it is even an experience sometimes, the feeling of a physical book. But for others the feeling of holding a book may not be as engaging as it could for everyone. All in all I would have to say the classic feeling of a printed book is one that can attract many to read and enjoy comics. But for me the digital format is something that I think many more people can enjoy. With the digital comics by Eryon Franklin they are given an even bigger platform to create art even in the surrounding areas or “gutter” of the comic panels already on the page. Comics are an art form that has seen much remediation, the revisiting of an older print art form being reformatted, being made more accessible and interactive in a digital format. I believe that there are benefits to both, the classic and the new. In the society that we live in I believe that it is perfectly reasonable that both mediums see advancements in how comics are thought of and created. I believe the key ideology from what we have seen and learned from comics we have so far observed is flexibility. Being able to create in an environment where there are not any real set rules or regulations and everyday some new variation of comics is created, which all in all is very exciting.